Back in January 2017, just after my visit to the NAMM show, while still in the Los Angeles area, I was asked by my good friend Steve Genewick if I wanted to come along and watch a recording session he was engineering. I said no, but I would come along and be his assistant/runner / be the bloke who coils cables, and to my amazement, he agreed. So on what will go down in history as the wettest day since records began in LA, I rocked up at 8 am to Alvas Showroom in San Pedro, California to help out in what small way I could on a live recording of the Akiko Tsuruga Trio. Featuring Akiko Tsuruga on Hammond B3 Organ, Graham Dechter on Guitar and the great Jeff Hamilton on Drums. Alvas Showroom is a small venue with a capacity of about 80 people. It's got a very cool intimate vibe about it as the audience is seated close to the performers so you really do get to see and hear everything. The plan for the day was to record both the rehearsal / sound check in the afternoon and the gig with a live audience in teh evening. The recording was to be made into an album that Steve would be mixing in his home studio for Akiko and her band. Steve had hired in a Pro Tools HD Native rig based around a Mac Pro (Cheesegrater) from local hire company Design FX and when I arrived he already had this up and running. 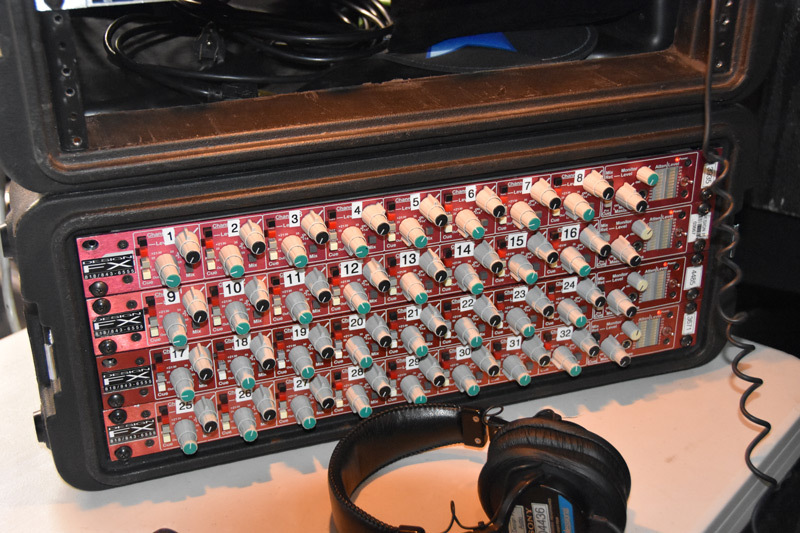 The Mic Preamps that they had provided were four ATI 8MX2 mic pres. Steve told me these are very clean sounding, great for Jazz. 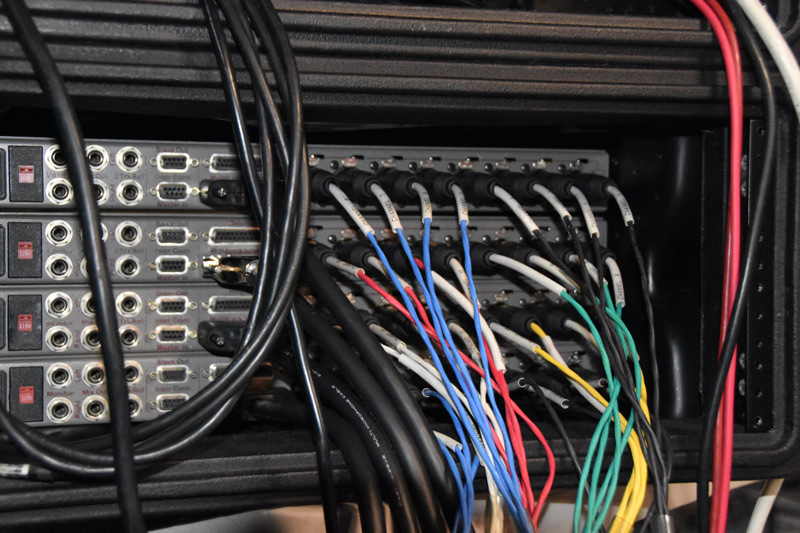 Each unit is a 1U rack with D-sub connectors that plug directly into the Avid HD I/O units. I've recorded Jeff Hamilton for so many years now, that I know what he likes and what he's after. His cymbals are very important to him, so I try and get a really clean detailed sound on them. In this situation, the OverHead mics are really just cymbal mics, I'm not looking to get a 'picture of the kit' kind of sound. 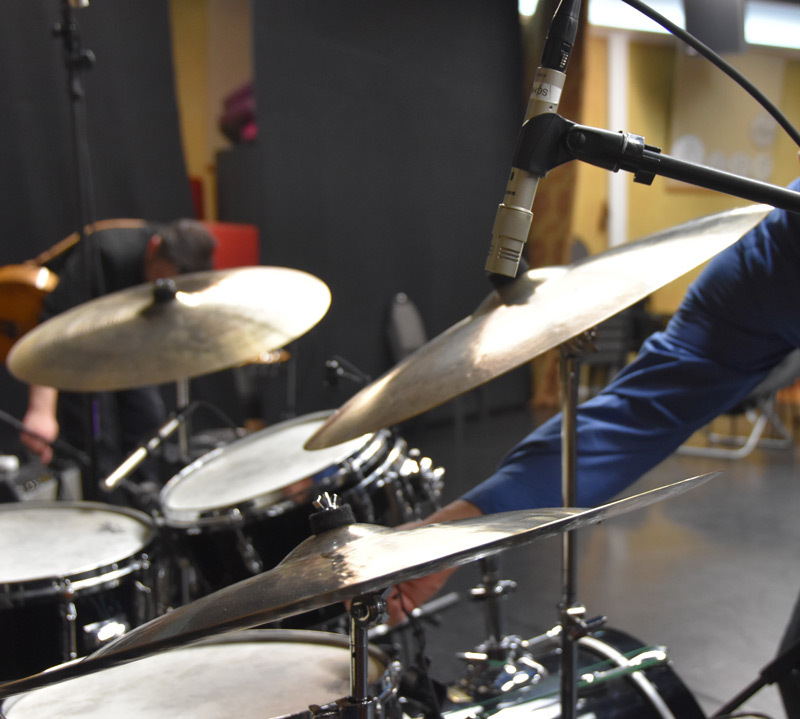 We've found in the past that the Overhead mics didn't capture the detail of the china cymbal that Jeff wanted, so many years ago we added the extra mic on the china cymbal. Steve used an Audio Technica ATM350 on the rack and floor toms. 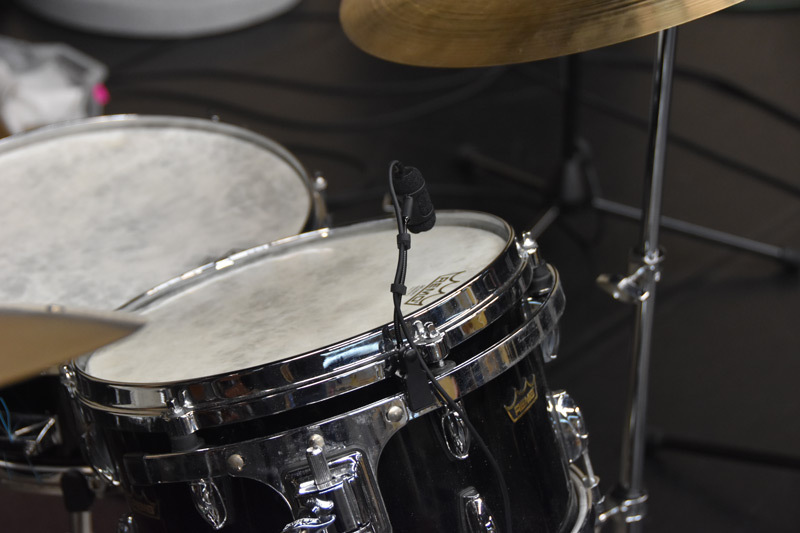 From the engineer's point of view, the placement of most drum mics is always a compromise. Keeping the player happy is far more important. Jeff plays the toms like a tuned instrument so needs to be able to get to the entire drum head as he hits the head with one stick and tunes it with the tip of the other. For Guitar Steve used a single Shure SM7B. 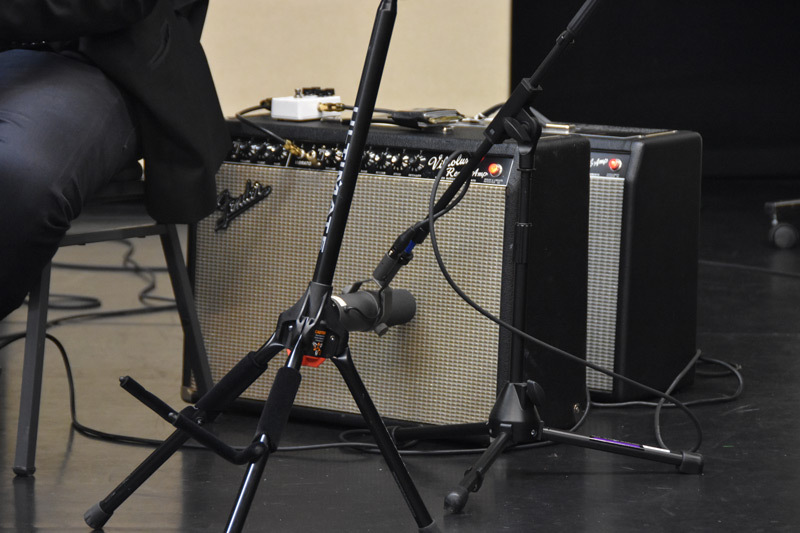 The mic was placed just off center to the left of the cone on Graham's Fender amp with a single 12" speaker. There was also another amp in reserve just in case. 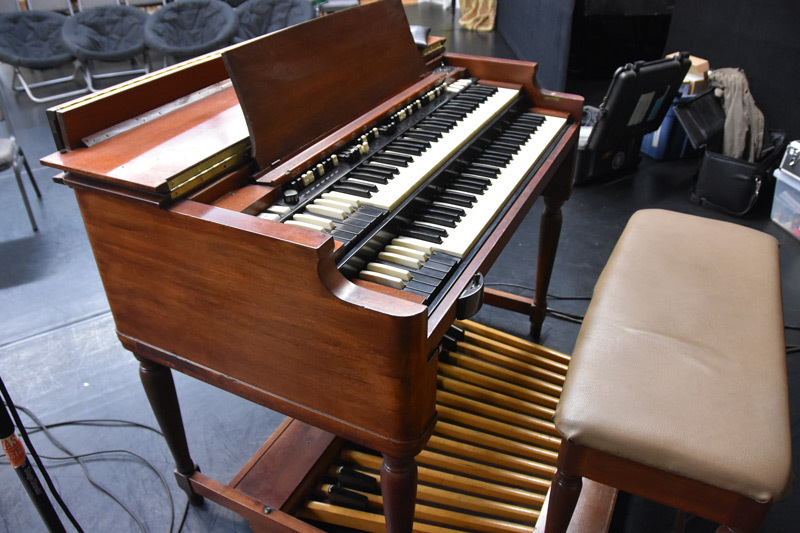 One of the first things that was mentioned to me when we started talking about this project was that Akiko, the artist, has not been happy with the bass on her previous recordings, and could I make sure we really captured that element of the organ. To that end, I added an extra mic, a Sennheiser MD421, and stuck it inside the Leslie cabinet, as close to the bass speaker as I could get it, and treated in with filters and EQ to really get the bass part to stand out. For the rest of the Leslie Steve went with a combination of microphones. For the top end and rotating horn, Steve chose a pair of Aston Microphone Spirit mics set to cardioid. These were placed just outside the volume vents at the top of the cabinet. He also placed an Audio Technica 4050 at the rear of the Leslie near the bottom sound vents. As I said earlier, the day of this recording was the wettest days in LA since records began. To that end, the evening performance was far from what you might refer to as "standing room only". However, the gig went very well with the trio playing for about 90 minutes. The small audience received the music very well. For me, this was a lesson in how to capture a live gig and it is summed up by the Scout and Guide Association motto. Be Prepared. Steve had booked all the appropriate suppliers and hire companies well in advance and even on a day when many would not be venturing out they all came through. Recording the gig is one thing but what about back up? I asked Steve after the event if he had any form of redundancy running while recording? We didn't have any kind of redundant recording on this project. While this was a "live recording", it was very controlled in the fact that the only purpose of the show was to make the recording. The addition of the audience was secondary, and the audience knew that. If we had run into any technical issues, we simply would have stopped the show, dealt with the issue, then continued on. Steve also had plenty of extra microphones and cables just in case of any failures. He had extra people on hand, including me to move and adjust mic stand if need be. It was a well planned and well-executed recording. The following day, before I left to fly back to the UK I had the chance to hear a first rough mix of the concert. It sounded fantastic. Clear, clean and with a full stereo image. I look forward to hearing the final mix and master when the album is released.